This is the fifth installment in our Wedding Cakes 101 series. Though we all want to have a big, beautiful, delicious wedding cake, we also don't want to spend a fortune. With the rising costs of planning a wedding, couples are looking to save money however they can, or at least ensure that they do not exceed their wedding budget. Today we will talk about the various ways to save money on your wedding cake. Instead of a labor-intensive cake with a variety of decorations and expensive fillings, keep it simple. Ask your baker for the most cost effective flavors, icings and fillings. Remember, "cheap" doesn't have to mean "worse". You don't need fancy pillars to separate the tiers of your wedding cake. 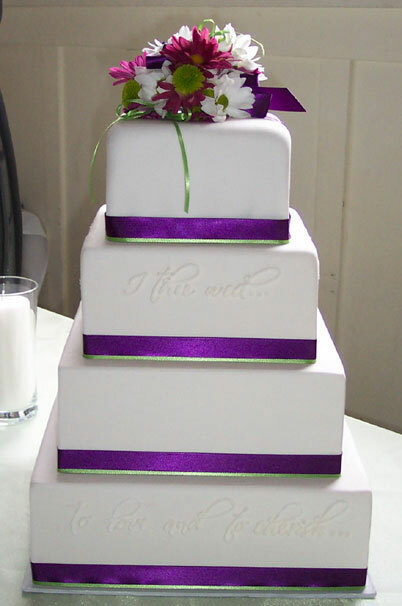 A stacked cake is just as pretty and won't have to rent or purchase the separators. This beautiful stacked cake from Pipedreams Cakes in Vancouver is basic yet beautiful. Contrary to what your caterer may tell you, you don't need to order a slice of cake for each guest. Many people won't have cake. Order 60 slices for every 100 people on you guest list. Offer fresh fruit or other cheaper desserts as an alternative. A fancy cake topper can be expensive and unnecessary. Instead top the cake with a few flowers or just leave it plain. 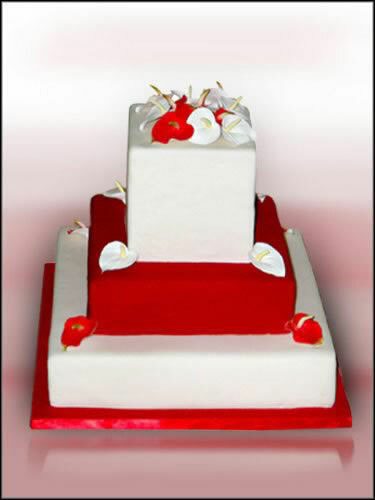 This beautiful red and white wedding cake is from Just Temptations in Mississauga, Ontario. Ask a friend or family member to bake your wedding cake. Do you have a close friend or relative that is an excellent baker? Ask them to bake and decorate your wedding cake in lieu of a wedding present. 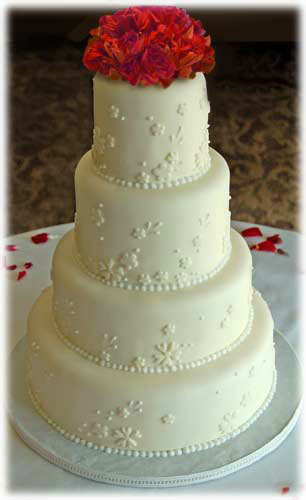 You can provide all the ingredients and they can bake a delicious homemade wedding cake for your special day. 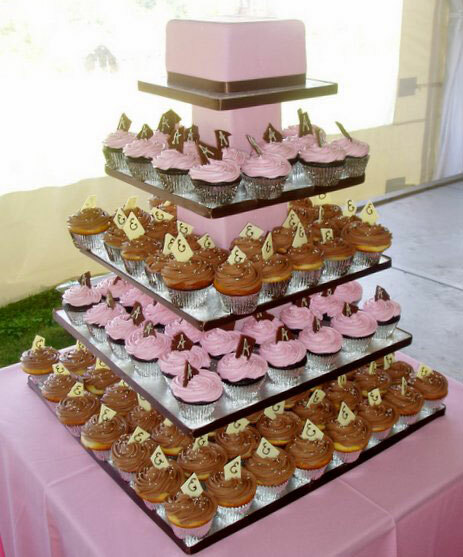 In recent years, cupcakes have become a popular option at weddings. They are cheap to make and can be arranged in the shape of a cake. Many bakers can provide cupcakes for your wedding or you can bake and decorate them yourself. These wedding cupcakes are from Cakes by Meg in South Surrey, BC. Many bakers can provide a magnificent dummy show cake to place on the cake table. Then, you can have the caterers serve plated sheet cake from back in the kitchen. A sheet cake is much cheaper than an actual wedding cake. Be sure to read our next installment in this series when we will talk all about fake cakes, including the pros and cons, and tips where to get the best faux wedding cakes in Canada. This fake cake is from SugarFAKE Cakes in Coquitlam, BC.